A collection of letters from Mother Teresa to various confessors is due out next week. 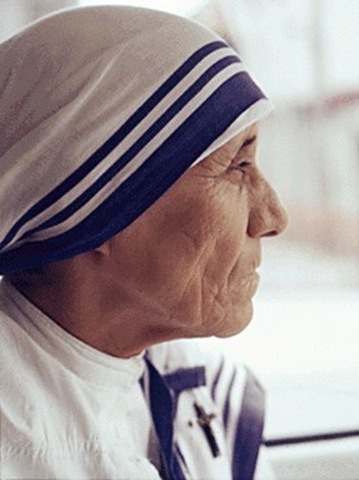 Mother Teresa: Come Be My Light, is already fueling many blogs and other on-line commentaries, the writers of whom are attempting, from quotes already published in Time, to use Mother Teresa to support their deep, solid, and impenetrable beliefs. Fundamentalist Christians are weighing in already, pointing out that the Roman Catholic Teresa was trying to worship a “false” Jesus, a non-biblical Jesus, according to their strict standards of biblical literalism. Hers was a Jesus, they say, which was false to begin with- a caricature perpetuated by a Church bent on survival. Some atheists have already begun to claim Teresa as a secret supporter of their position of non-deistic rationality. Some have already called her a hypocrite, giving lip service to belief, while harboring doubt. Both groups are making the kind of mistake that is easy to make when the world is viewed in the mechanistic manner both groups base their viewpoints on. Most fundamentalists see the universe as a machine, manufactured piece by piece, by God, for the benefit of humankind; and many atheists see the universe as random collection of stellar accidents, devoid of transcendent and sacred meaning beyond the moment. Mother Teresa, on the other hand, lived down in the mire with the rest of us. She lived where the call to alleviate suffering in the lives of others felt so real that she could ascribe the voice of Jesus to it. But she worked in the arenas of life where it seemed impossible for a God of love to have ever been present. Hers was not an either/or position. Her doubts did not rise from the rigid and moribund philosophies constructed of doctrine and paper and words etched in rock, that both the accusing fundamentalists and the Teresa-claiming atheists live their lives within. * She was human, a human filled with doubts just like the rest of us, but one who had the courage and vulnerability to write of them. Unlike many of us, however, she poured herself into that “emptiness” anyway. She didn’t flee from it; she didn’t reject it. She alleviated suffering. She waged peace. She acted in human, healing love, as her Order still does. Mother Teresa may well have felt ignored by God. But, because of her, many many have not. *For the record, I am speaking here of those fundamentalists and those atheists who are making the Teresa-noise at present. The strident ones of both camps are making fools of themselves (I think) and do not reflect those fundamentalists who truly do try to follow Jesus, nor those atheists (and there are many, many) who couldn’t care less about adding new trophy heads to their walls, but just live- congenially and rationally. ← Excuse me (again), while I deal with this (again).. I feel so sad when I think of the prejudices of one part of the body toward the other. Don’t they realize, we are all part of that “all” that holds together in Christ? I can never believe that a true, passionate believer exists who has not experienced a dark night of the soul. Mother Teresa was a tremendous and a glorious human being. But as these sayings in her letters shows, she knew that there were fundamental problems with Christianity. I was a Christian till a few months back, yet due to these fundamental problems, I found tremendous answers through Pantheism-my current theosophy. God does not expect us to live Christian lives that are cookie cutouts. Each of us who claim the name of Christ have struggled with a dark night or two or three or more. The apostle Paul said that faith is made perfect through trials and that only when we are weak can we be strong. In our darkest moments when faith seems to fail and doubt nearly overcomes us the Spirit of God is present working with us and for us. Jesus is before the Father saying, “I understand their struggle.” Look at the writings of King David and the prophets. Darkness and doubt and failure are everywhere and yet they always looked to God and they were always upheld by His omnipotent hand. Anyone who would speak ill of Mother Teresa or anyone else struggling or doubting needs to look in the mirror and do some deep soul searching themselves. We cannot be like the publican in Luke 18 who stood so “righteously” before God. It sounds like Mother Teresa felt more like that tax-collector sinner who wouldn’t lift his head up to God but instead beat his breast and asked for mercy. Jesus said that he was truly justified. I am not a fundementalist, protestant, Baptist, Catholic, conservative or liberal. I am a follower of Jesus Christ and as such it is good for me to struggle and doubt. I am better off when I do.